I wrote a little blog about Groudon when it came out. Announced to appear today January 12th until 1 PM PST February 14, 2018. One would assume, that Rayquaza would be next. Personally, I can’t wait for Rayquaza. First let us deal with Kyorge. Kyorge is a water type pokemon. Typical wisdom woudl say Electric and Grass types will be your best battlers. Thanks to reddit user, RyanoftheDay, we have his info graph for best Kyorge counters. Kyorge can use Dragon Tail, or Waterfall for it’s Quick Move. 3 Charge moves are Blizzard, Thunder, and Hydropump. It looks like Raiku (Thunder Shock + Wild Charge), and Sceptile (any + Leaf Blade) are your best against all movesets. Though Sceptile might not last too long. There are alternatives of course. Like Jolteon and others. Of course as soon as I heard, I was scanning the local discord group to see if anything was out there. It seems like Groudon are still possible too, so you kind of have to show up and wait. Report came in that a level 5 hatch was happening at The Great Mall. It is a sponsored Sprint gym as well, and EX-Raids have happened there numerous times. I was going to go, then I wasn’t. Finally I decided to get over there before the hatch time. I made it with about 5 minutes to spare. So many people there. Eventually the hatch happened, and it was Kyorge. Next the people started breaking into groups. Valor over here, Mystic over there, Instinct was going public group. The count down timer is ticking, and I am looking through different pokémon. I couldn’t decide what to try out, so eventually just settled on whatever. I had heard from some others that it was hard to catch, and they were not wrong. First, Kyorge is really far back. Already that makes it tough to land Excellent curveballs. Kyorge also moves from left to right, and attacks from time to time. Normally, I wait for the attack animation before I throw. I had 10 balls to throw. It took my 4 to catch it. CP 2296. 87% 14/11/14. Not too bad. I did do a second raid at another EX location, but failed to catch it. One guy did attempted to catch it in AR mode (Only on newer iphones), but he thought he bugged it. I have seen some people reporting that it is much easier to catch doing the AR Mode. Time to get out there and get Kyorge. Plus, Pokémon GO Community Day will be coming January 20th. It’s a great time to play. It was just yesterday, when people wondered what was next for Legendary raids Pokémon Go. We had the extension of Ho-Oh. That ended at 1pm (PST) on December 14th. Many expected Groudon to show up right away. When he didn’t, many people in my local discord channel were shocked. Earlier today, it was announced on Pokemongolive.com. Groudon, the Ground-type Legendary Pokémon originally discovered in the Hoenn region, is now appearing in Raid Battles around the world! I quickly logged onto my local Discord group to see that others, like myself, had already reported the news. The catch, Groudon is only available till 1:00 p.m. PST on January 15, 2018. Still plenty of time to get out there and Catch’em. As with any of the raid bosses, I always do a bit of research. I like to find out the weaknesses, and what other people are using to battle. I played through all the Pokémon games in the past. I knew things like Groudon is a ground type Pokémon. Things are not always 100% the same in the orginal games, and Pokémon Go. Places I like to check are sites like pokemongohub.net. They usually have a good breakdown for counters to use. 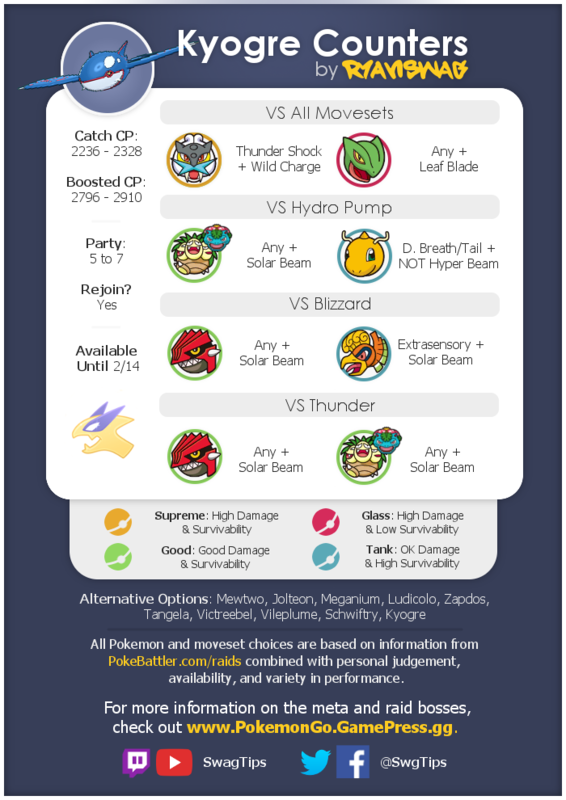 Suggestions like Gyrados with Waterfall/Hydro Pump. Another good resource is TheSilphRoad. A very good resource for all things Pokémon Go. A normal 100% Groudon is CP2328. Weather boosted, the CP2910 is your 100% target. Raids get release. We get reports of level 5 raids popping up in downtown San Jose, but nothing up in the Milpitas area yet. Of course, it wasn’t long before they were all over here too. Naturally, I was out getting lunch with the family when the first wave came in. I was watching discord, and seeing if there was someplace I could get to. Finally, I saw one coming up about 15minutes from me. I got there before the timer. One group showed up just as it hatched. They said they tried to do one raid with 8 people, and was unable to beat Groudon. No idea what levels they all tried with. Now it was time. there was a big enough group to go for it. I believe we had 16 or so people, and more on the way. We beat it, and I caught it. CP2274 80% 12/11/13. Not too bad, and I was glad to have caught one on day 1. I was going to head home after that, but stopped off to grab a few Pokémon. I noticed in discord that another raid was about ready to hatch. So off to that one I went. I got there a little after hatch time, and one group had already started. I was a littel worried, but soon plenty of other showed up. We finished that one, and I caught that Groudon as well. CP 2296 87% 14/11/14. Others from the group were heading off to their “lucky” gym to raid. One guy had gotten 3 EX raids from that gym, so pretty lucky to him I guess. I didn’t want to head off that far. There was a closer raid going to happen in about 20 minutes. So I headed there next. I was early, and there were a few Pokéstops around. I grabbed those, and tried to gauge if we had enough people around to do the raid. I posted in Discord to see if people were coming. Have no fear, we had plenty show! I had forgotten to try recording my previous raids, but this one I did record it. Once again, I was able to catch this one. CP2323 98%! 15/14/15. I almost got that 100%. I went home after this. Figured I would call it a day. I couldn’t believe I had caught each one so far. A bit later, I went out with my son to catch a few Pokémon. As luck would have it, I saw one more raid being formed up at a nearby Starbucks. This one has had EX Raids at it as well. My son hadn’t raided Groudon yet, so off we went. Once again, plenty of people even with it being later on in the evening. There was enough that people did a split group. Ours has 10. We beat it, and I caught it again. CP2276 78% 15/10/10. Unfortunately, my son was unable to secure Groudon. So we will have to try again. I went 4/4 today, so I will probably have the next batch all run from me. I was glad to see I got to use my small army of Ho-Ohs for this. The fight seemed good enough. Once again, with server lag, dodging is hard to do. Catching Groudon did seem more difficult. Ho-Oh provided it’s own difficulty by being so close. Groudon is farther back. He doesn’t jump. His attack can be harder to time. I mostly just spun and threw when I thought he wasn’t going to attack. Different from other Legendaries where I would wait to throw until after they had the attack animation. I would imagine we would see Kyogre as the next Legendary after Groudon. The one I am truly excited for though, is Rayquaza. Pokémon Ultra Sun and Ultra Moon release day! Well, it has been a year since Nintendo released Sun and Moon. Many things have changed compared to the older games of the past. Gone is the need to teach your Pokémon specific HM’s (Hidden Machines). Now you unlock different whistles to ride specific Pokémon. Need to fly, summon that Charizard for a quick flight. This opened up the game play a bit. No longer am I locked into which Pokémon I have to teach Flash to get through a cave! Also gone in the Sun and Moon adventures, gym battles. I say gone, but really it was replaced with Island challenges. Still, a bit of a difference when coming from the older games. We also got the release of Ultra Beasts, Z-Moves, and lots of new Pokémon (including Alolan variants). Ok, ok. Enough about last year’s release. It’s time for some new adventures in Pokémon. Today is the release day for Pokémon Ultra Sun, and Ultra Moon! Pokémon Ultra Sun and Ultra Moon will be the last of the Pokémon RPGs released on the 3DS system. The Developers really wanted to push the limits of this game, and packed it full of goodies. First off, Team Rainbow Rocket! Team Rainbow Rocket is made up of bosses from the past Pokémon games. We have Giovanni from team Rocket, Maxie from team Magma, Archie from team Aqua, Cyrus from team Galactic, Ghetsis from team Plasma, and Lysandre from team Flare. That’s a pretty decent lineup. It would also seem that all the Legendary Pokémon from the past games will make appearances in the new Ultra Sun, and Ultra Moon games. Of course, available Legendary Pokémon will depend on which game version you are playing it seems. Ultra Sun’s Exclusive Legendary Pokémon are Ho-Oh, Raikou, Groudon, Latios, Dialga, Heatran, Reshiram, Tornadus, Xerneas. Ultra Moon’s Exclusive Legendary Pokémon are Lugia, Entei, Kyogre, Latias, Palkia, Regigigas, Zekrom, Thundurus, Yveltal. I haven’t seen any notice if the Mythical Pokémon will be in the game at all. It looks likes like there may be a few ways to encounter the Legendary Pokémon. Ultra Wormholes seem to be the place to encounter most. There are some that need a special condition to trigger. Giratina can be encountered if you have Dialga and Palkia in your party. Suicune needs Raikou and Entei in your party. Rayquaza needs Groudon and Kyrgre in your party. Kyurem will need Reshiram and Zekrom in your party. Landorus needs Tornadus and Thundurus in party. Some Legendary Pokémon will also have Mega/Primal evolutions available. There are new Z-Moves, a new Battle Facility, Totem stickers, ride the waves with a Mantine, and a bunch of other cool features in the game. I ended up getting the Dual pack this year. It comes with both games, 200 Pokéballs (via download code), and 16 Art cards. The cards are pretty nice. They have the Pokémon art on the front. They list when the Pokémon originally appeared in game, Pokédex entry number, a brief description of the Pokémon, and the stats on the back of the card. The list of Pokémon art cards is Mewtwo, Lugia, Ho-Oh, Kyogre, Groudon, Dialga, Palkia, Reshiram, Zekrom, Xerneas, Yveltal, Solgaleo, Lunala, Dusk Mane Necrozma, Dawn Wings Necrozma,and Dusk Form Lycanroc. They cards are nice, but I really have no way to display them. That might be a project to come in the future. Now I got both Sun and Moon last year, but never finished Sun (yet). I did play through Moon, and mostly enjoyed it. I kinda stopped after getting the last Ultra Beast. I wanted to keep playing, but then I wanted to beat Sun. In the end, I just never got around to it. This year, I mean to beat them both, and play through all the content I can. Got to catch’em all after all! So now I have them in hand, and the real test comes now. Time to play, and this time review the games. I’ll get an update once I beat Ultra Moon first. Pokémon Sun and Moon are here! Time to get out there and catch them all again! Pokémon Sun and Moon have been released to North America, Japan, and Australia. Europe will have to wait until November 23rd. I got a call from my local Gamestop. They would be releasing the game at midnight. So of course, I had to pick them up. I picked up 2 copies of each game tonight, and they gave me two posters. I’ll have to come back to pick up 2 more games for my youngest son. There was probably 50-75 people there easy. The game stop had some weird grouping system going on. Depending on when you paid for the games during the day, you were assigned a group. I stopped off on the way home from bowling, just before 10pm. I was put in group 4. After that, I came home. I didn’t want to wait around there for a couple of hours. Plus, I brought my oldest son with me. We went into the Gamestop store about 11:45pm. I took the first picture of a few people just hanging around. Then they had us all line up, then we waited for midnight to roll around. I wanted to get 2 more copies, but I would have had to wait for everyone in the store to get their games first, then I could buy more. I didn’t want to wait that long, and just headed home. I am looking forward to the new Pokemon in the Aloha region, and to see the region variances. I hope the Z moves will work out to be a lot of fun. I don’t care much for the weird dance moves the trainers are doing. I imagine it will be similar to Mega Evolution movement in the previous games. I only played the demo that was released so far, so I’ll have to see how the gameplay is on the release games. I’ll bring up another post as a followup to this one soon.